Lets start with the Kindergarten school building itself (above). The text reads: “We arrive at base camp, then orbit while we look for a place to dock.” So, inspired by the text, I immediately had the idea of using the black asphalt of a parking lot as the black vastness of “SPACE” which all of the other elements would play against. I definitely wanted to have the building feel like a space station in some way, and in researching photos of actual stations I was immediately inspired by the large rectangular panels and foils that extend out from those station’s bases. In my illustration I decided to treat the white lined parking spaces around the building as the panels/foils jutting off of a station. The family car/craft, while not being a literal space ship, is colored with the same black and white pallet that a NASA space shuttle displays. 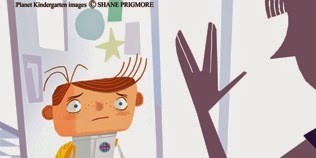 When mom and dad drop off their brave explorer (above), mom incorporates a heart felt Vulcan gesture into her goodbye wave. I wanted to create some sense of a Martian, or alien landscape when we entered the classroom with our main character. Stacks of red, classroom blocks did the trick. When I was a young student, I remember several of my classrooms being decorated with various paper stars. Sometimes student’s names would be written on them, often hanging from the ceiling, sometimes stapled to the walls, but all were the inspiration for the star motif you see throughout PLANET KINDERGARTEN. I introduced you to the character of ROB in my last post, but he was not the only thing inspired by the world of robotics. 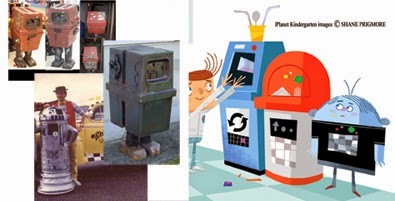 These lunch room receptacles were inspired by the Star Wars Gonk Droids, as well as the robot from the little known 1980s children’s television series “Whitney and the Robot”. Riffing off the “black asphalt as space” concept once again, I thought that when incorporating bits of recess symbolism we might get a kind of subliminal solar system visual. Complete with Milky Way. The “Nap Time” section of the book was one of the first areas I had a clear “space” concept for. I remember my elementary school nap time fondly. I had a black mat that I would lie down on as we listened to the class record player project Burl Ives “Little Black Duck” into the darkness. 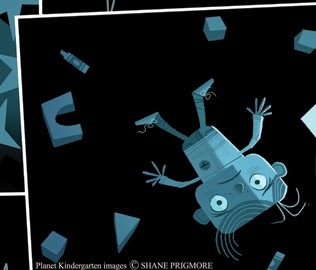 When delving into the imagery for the book, I chose a down shot on our character lying on a black mat with a couple classroom objects scattered about him to help create the effect that our little “astronaut” is floating in space. 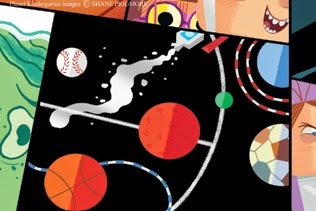 These are just a few more of the concepts and elements I had the pleasure of playing with while creating the visual language of PLANET KINDERGARTEN. Lots more happening with Planet Kindergarten, so stay posted. An awesome post & must read it.. It gave me a lot of useful information. thank you very much. Thanks This is the best community for discussion about any topics and sharing best ideas, knowledge and thought. and have great Article sharing platform. I like this concept. Thanks a lot of all.